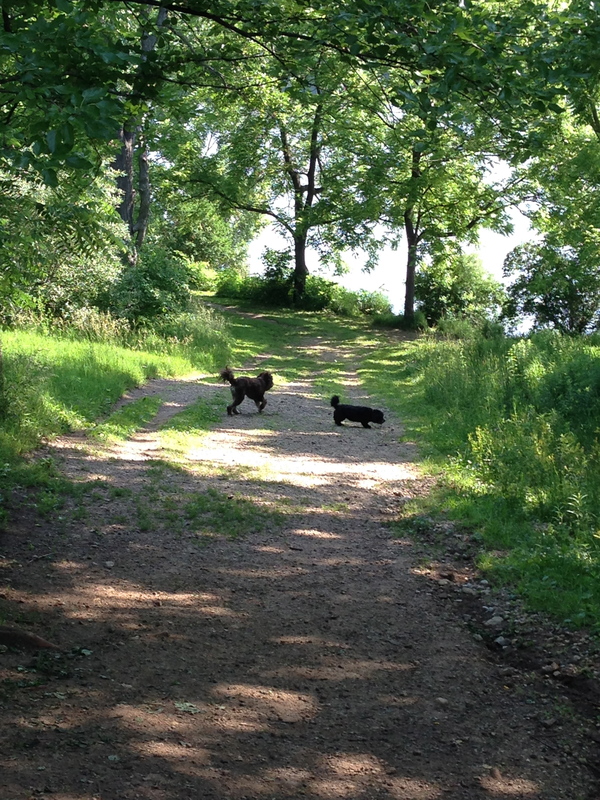 When I walk the river with my dog, or dogs when someone approaches, I always smile and say, “Mornin’. And it’s a rare morning on the Fox when someone doesn’t respond in kind. Yes, many are strangers, most are familiar strangers, people who get up early and run, or walk, with dogs and without dogs, or ride bikes, and we are a special breed who for the most part don’t wear ear buds because we love that our river has the sounds of life in every season, even the very coldest, when, if you’re lucky, as you walk in the snow up to your knees, you’ll hear the flapping wings of the resident Blue Herron as it lifts into the gray sky, gliding to the other side of the frozen river to watch as you struggle on in the deep white snow and silence. Ain’t nothing like a walk like this when the river is almost exclusively your own. Even in the snowiest times on the river there is a man who everyday for years, rides his bike to work with a little snow scoop on the back, so there is always a narrow cleared-off path that we can walk on when we are tired of struggling in the deep snow. Every single day without fail, no matter the weather, he rides his bike to work along the river. I love that man, have never met him proper, just a “Mornin'” and on we go. A familiar stranger. While on the Jersey Shore last week, twinsie and I took early morning walks on the boardwalk for 3 or 4 magnificent miles along the Atlantic with the waves serenading each step. As we walked we encountered many walkers, bike riders, runners, many with ear buds, many without. Their skin as dark as beef jerky, and they came in all shapes and sizes, some even stopping at the Dunkin Donuts on the boardwalk for a donut and coffee. 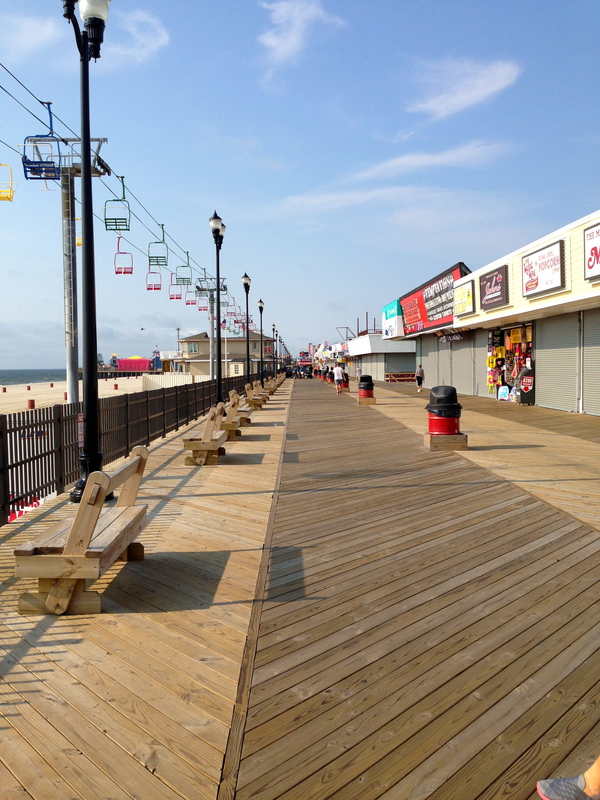 Each morning we walked, I’d nod and say “Mornin'” to the others on the boardwalk without a single nod or “Mornin'” back. Not a single one. Not even a smile. How strange. During one of our walks, I caught myself no longer attempting a “Mornin'” anymore, I kept my face toward the ocean or looking down at the boards as they moved quickly under my striding feet, examining the patterns of the newly resurrected boardwalk. It was sort of like a rejection, never getting a reaction back. Like a baby who smiles at her momma, and when she’s not responding back to her baby’s attempts at connecting, begins to cry. It’s innate, it’s in our genetic makeup, the human spirit, to want to connect, but somehow, it got lost to the many people we saw on the boardwalk in Jersey. And I found myself lost in it, too, not even attempting a smile any longer, looking through people, around them, avoiding the rejection of a simple greeting. How easily I fell prey to avoidance. The culture of the East, boardwalkers aside, is intriguing to us, and we have met many friendly and helpful people, some who have become familiar strangers over the years, who are happy to see us when we visit certain shops. We love it there. I just wonder what happened to that need to connect, where did it go? Here in the midwest we cultivate farmlands and smiles and greetings, even in Chicago, there is a sense of connection to the people around us. While I loved walking that beautiful wooden stretch along the Atlantic, without the human connection of “Mornin'”, there’s no place like home. I like to greet people, too, whether on a power walk or window shopping at the mall. Even here in the “friendly” south, there are those who don’t respond or respond with a look that says I’m crazy! I know, Jan. I think there are people everywhere like that, and shyness is definitely a factor, but, I think a smile and a greeting is the easiest way to bring joy to someone’s day, and I honestly feel it has an impact. On an endless pursuit of happiness and being present in the moment. As a busy mom of twin teenage daughters, wife, and teacher... that isn't always easy!